The First AGA – Tygem Pro Finals — under way now in Black Mountain, North Carolina — are double-elimination. After the first round the contests are best-of-three matches. After his first loss a player drops to the second band; but the leader of the 2nd band, who at the end will have had only one loss, will play a match with the loser of the championship match, who also will have had only one loss, to determine second place. That’s important because second place will be the second American certified professional. 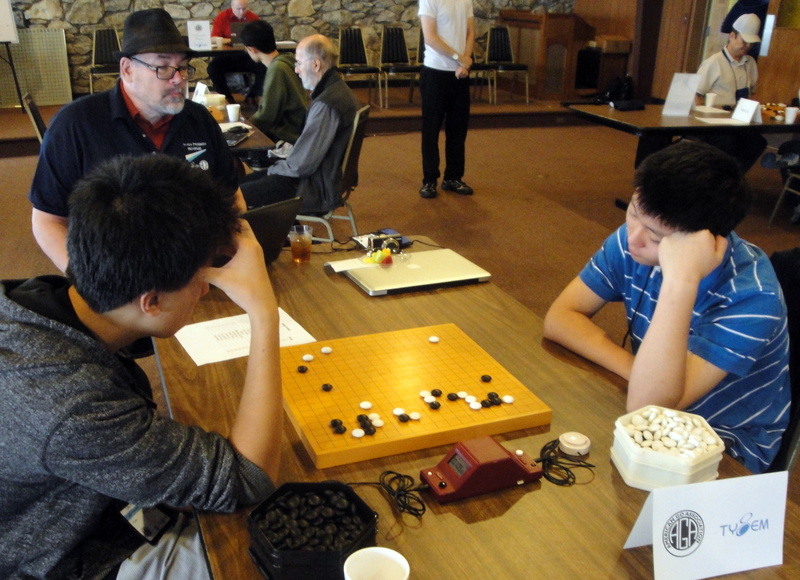 Andy Liu has been a steam roller; not only has he won all his matches, but he has won all his games, winning matches two-zip vs Janing Gan and Eric Lui. As I write this, Gan-Sheng Shi (who beat Jing Yang 2-1 the previous round) is playing Hugh Zhang (who beat Yuan Zhou 2-1) in their third-game playoff (they split yesterday) for the right to challenge Andy Liu for the championship. Either way a bloodied veteran will confront a locomotive in what will have to be a great battle. I can see why recording other’s games is so important in go pedagogy: you have to spot the move before the opponent replies. A few moves played in rapid succession, which can happen abruptly at any time, can make the move order mystifying even if you catch up to the current position. So the recorder must effectively play the game, identifying candidate moves and sorting them, so he can recognize the move and record it before play progresses too far. It’s quite a bit of work, but it’s fascinating. You are putting yourself in the head of another player, as in Rengo (Pair Go). The two games I recorded yesterday wore me out about as much as if I had played two rounds myself. Fortunately, sitting in a rocking chair on a cottage veranda in the cool night-time breeze at the end of the day, overlooking the wooded ravine passing among the cottages here in Black Mountain, relaxes beautifully. The knock-out rounds for the European Championship begin Thursday at the European Go Congress in Bonn, Germany. The eight players who have qualified for the quarters are Shikshin (Russia), Silt (Czech Republic), Burzo (Romania), Debarre (France), Tormanen (Finland), Surma (Poland), Simara (Czech Republic) and Lisy (Slovakia). Click here for latest EGC news, including top board games. 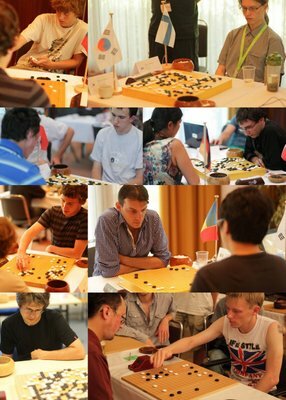 Russia has won the European Pandanet team tournament, defeating the Czech Republic, Ukraine and France.